At last week’s Dubai Airshow, MBDA presented SmartGlider, a new family of air launched guided weapons, for the first time outside Europe. “We are seeing a huge interest in the SmartGlider family from the region. The region’s air forces are equipped with the latest generation of combat aircraft, particularly European combat aircraft, and Smart Glider allows the full exploitation of the sensors and systems that equip these modern aircraft - to deliver military effects that could not even be considered before,” stated Florent Duleux, MBDA Vice President Middle East. 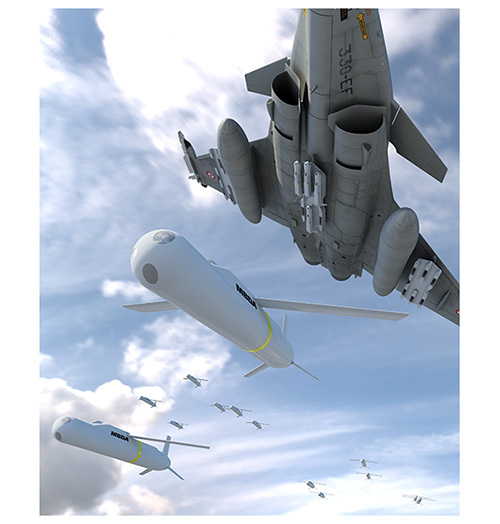 The new SmartGlider family of guided weapons is optimized to counter anti-access strategies and other emerging battlespace threats. Designed to complement newest and future fast jets, SmartGlider forms a family of all-up-round glider weapons, with folding wings and a range of over 100 km allowing the combat platform to stay at safe distance from the enemy defenses. This new generation of air-to-ground weapons is designed to counter new networked short- and medium range surface-to-air threats, as well as moving/relocatable targets or hardened fixed targets. The compact family member, SmartGlider Light, is 2 meters long and weighs 120 kg. 12 to 18 SmartGlider Lights can be carried on an aircraft thanks to a Hexabomb Smart Launcher (HSL) capable of managing reactive strikes without affecting the pilot’s workload. As such, the SmartGlider Light will allow first-day-entry by saturating and destroying enemy air defenses. For general purpose missions, the SmartGlider Light can be engaged against a wide spectrum of targets, from hardened and defended fixed targets such as hangars, to relocatable targets that can only be destroyed from a standoff distance with significant lethal effects. Last, MBDA also prepares a 1,300 kg SmartGlider Heavy able to carry a multipurpose warhead of more than 1,000 kg to deal with large and hardened infrastructure. SmartGliders will integrate new technologies in their guidance and navigation functions, as well as multi-purpose warheads. Thus, they will be able to reach and destroy the best defended targets, notably enemy air defenses, thanks to a mix of optronics and radio frequency sensors that makes them robust against anti-access measures. “The SmartGlider family considerably reinforces the air-to-ground capabilities of the combat platform, sitting between bombs equipped with guidance kits and cruise missiles. Designed for use in high volumes in order to saturate air defenses, SmartGliders Light can be fired in groups behaving as wolf packs that will coordinate to saturate enemy air defenses,” explained François Moussez, MBDA Military Advisor. With a significant presence in five European countries and within the USA, in 2016 MBDA achieved a turnover of € 3.0 billion with an order book of € 15.9 billion. With more than 90 armed forces customers in the world, MBDA is a world leader in missiles and missile systems. MBDA is owned jointly by Airbus (37.5%), BAE Systems (37.5%), and Leonardo (25%).